Our services are fast and reliable. Our service providers are a group of friendly, highly skilled individuals who are always mobile—their engines are never off, and they are always on alert for that next call so that they can rush to you and put you back on the road. No matter the location, even if it is considered 'remote' our intrepid bunch can make it. Now, several key-related issues can curtail your motion ahead and you might be familiar with most of them. 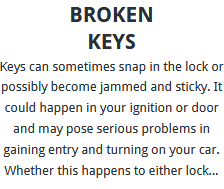 The classic cases of lost and Broken Keys can be easily taken care of once you place the call. Our team will reach you immediately, and will cut you a brand new key in no time after a routine verification of ownership. They carry with them all the latest tools to fashion any key to fit a vehicle regardless of its make. We also provide replacement key services for nearly every reputed manufacturers like BMW, Chevrolet, Hyundai, Kia, Land Rover, Daewoo, Citroen, Mazda, and many others! Today nearly every car on the road comes with a transponder key. Transponder keys assist in easier identification of your vehicle and offer increased security. However, in the cases that they decide not to work, they can be quite a headache. (Even a case of dropping them might cause enough damage for it to stop working altogether!) Though when the transponder chip ceases to function, you might consider contacting your dealer, we offer you a much better and cheaper option. Our team is vigorously trained and picked from the best of the lot; they are always in accord with the latest technological innovations (remember, they carry all the latest tools). 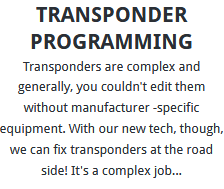 Transponder programming if dealt with carelessly can lead to more complications, and therefore we cannot overstate the service that our team offers. When they arrive at the scene, they combine their technological know-how with swiftness and their rare gift for beings excellent locksmiths. The result would be a service of the highest standard. It is clear that excellence and dedication have contributed to our success in the current market. We are a premier company in Hull and are in much demand. Our services come at an affordable price, making us a far better choice than many others, and choosing us will also spare you from moving transporting your vehicle to your dealer. We will be glad to come to wherever you are and offer you our best services. Give us a call, and we will be there in a jiffy! There are very few things worse than losing the key to your BMW, Lexus or Skoda. Perhaps you damaged it or even broke it while trying to enter your Porsche. Perhaps there's nothing worse than a Ford stuck in the middle of the road. Don't worry we have got you covered. Our efficient car locksmith team can deal with anything you throw at them. They can relate better than anyone the misery such 'key' issues can inspire. They work day and night; they are swift and elegant and always on their toes, and their degree of productivity is the stuff of dreams. Our team is capable of reaching your location as soon as possible. Even if you are stuck in a location outside all maps, we will make sure we come to you. Did we say that we work 24 hours every week? Yes, we do. Our team is indefatigable and always hungry for new challenges. Once you dial the digits, they will soon appear and fix you a new key for your old one that you lost, or the one that got broken. 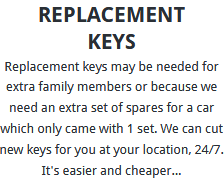 We also are home to quite a good collection of keys suited for replacement, so that our locksmiths can offer you keys to replace old ones without any delay. 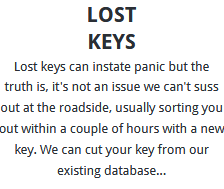 Moreover, for those cars that work on transponder keys, we offer the best service in town. Dealing with transponder chips demands one to be technically updated and adept, something our competitors lack and we excel in. Our car locksmiths frequently keep themselves updated on the recent changes in the field and are provided sufficient training and examination at frequent intervals to verify their competence. We extend our services to almost every reputed car manufacturing company. Some examples: BMW, Chevrolet, Daewoo, Ford, Honda, Jaguar, Land Rover, Mazda, Skoda, Subaru, Toyota, Volkswagen, Volvo, etc. Our team has with them all the new equipment necessary to forge keys that can fit all models in addition to blank keys, transponder chips, and other tools. Before they take your leave, everything will be verified more than once. Customer satisfaction is paramount to us. Our services get fuelled by your joy and satisfaction. We only ask for a reasonable amount of money in comparison with the money you would have to shell out to move your vehicle all the way to the dealer. What are you still waiting for? Call us! Our skilled auto locksmith is already on her way! All Rights Reserved © 2018 Auto Locksmith Hull.